Justin Bieber's entourage is under investigation for a brutal fight that left a nightclub patron sprawled out in the parking lot and injured badly enough to be taken to a hospital. The incident occurred outside South Pointe nightclub in Southampton on Sunday at around 3 AM. 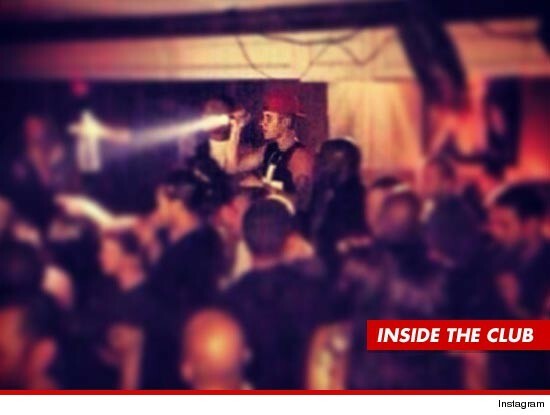 Bieber had arrived an hour earlier and inside the club we're told the booze was flowing in the VIP area. A girl inside the club tried to speak to Justin but was denied. She came back with a guy -- the alleged victim -- who apparently had beef with the situation and at that point Justin went nuts, pulling off his shirt and screaming at the dude. Justin and crew left the club but in the parking lot things flared up again. Justin -- who was in his SUV -- jumped through the sunroof onto the hood. At that point it's unclear what happened, but the alleged victim was knocked out on the cement. According to cops, Justin's people apparently went after the guy, although we're told the alleged victim was aggressive as well. An investigation is underway after the alleged victim filed a police report. Justin is not the target of the investigation -- it's his crew.